Before we go further, I should point out that I have never been someone who understands motors. You’d think growing up in the Detroit area I’d be fluent in all things horsepower & RPMs, but I’m not and I’m okay with that. 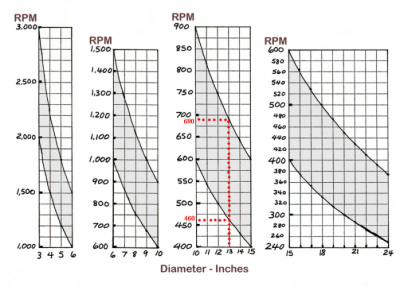 But regardless of whether you speak motor, or not, a basic understanding of RPMs is important for woodworking tools like drills, routers, and lathes. In fact, the more time I spend at the tool rest of my lathe, the more I’m starting to understand why I’ve been getting such hit and miss results with my router and drill bits. So in a nutshell, it turns out the variable speed dial on the drill press or router motors weren’t as much about “some highly advanced technique I’ll never employ” as I thought. Okay I’m jesting more than being serious, but there is some truth there. I never took the suggested guidelines for RPMs serious because I was either in a hurry or more-than-likely I didn’t believe they mattered all that much. Then, in the end, I’d look at my frayed or burned edges and either blame the bit manufacturer or the materials themselves. This would inevitably be followed up by cleaning them the best I could hoping not to accidentally alter its shape. But that’s all about to change! Thanks to some great feedback about the latest turning project, the Wood Body Coffee Scoop, I’m starting to see just how much the RPMs can have an effect on the results. And while I won’t claim to fully understand it, the biggest lesson I’ve learned is that frequently the better RPM range might be the lower one. This is especially true for avoiding the burning effect of a larger diameter drill bit or even for rough turning square stock to a round shape. I don’t know why it’s so counter-intuitive to me? 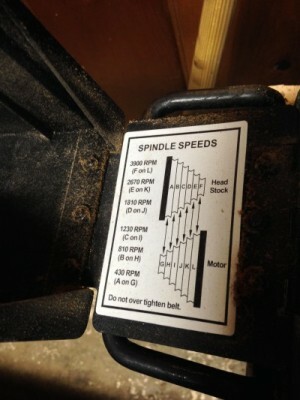 But the idea that the larger the diameter the spinning tool or block of wood is, the slower the RPMs of the motor should be, it seems so wrong. In my mind it seems like you’d want it spinning faster so there’s more cuts in the same amount of time as a narrower bit. But as I’m standing at the lathe and I have something large spinning around I start to see how unstable it looks at that higher speed. As a result I’m also realizing how dangerous and ineffective my cutting action can be. 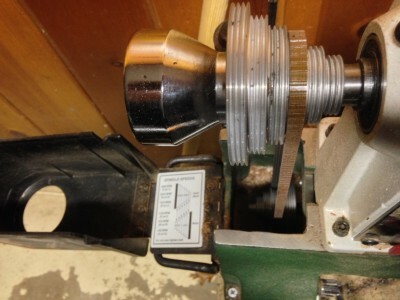 So when I adjust the belt on my lathe to something slower, I immediately see what appears to be a more stable rotation and more importantly something much safer to work on. To help further solidify this concept for me, I started thinking of two figure skaters spinning. One is a petite and graceful skater and the other is me. The petite skater can easily spin in a circle and stay balanced and upright at high speeds. Me, because of my extra bulk, could potentially spin at that higher speed but I would never be fully balanced, nor upright. But if I were to rotate at a slower rate I know I could. Seeing this concept at work in this manner now makes me cringe at the thought of all those times I used a very large diameter router bit without slowing down the speed of the motor. Thankfully, the only damage ever done in those situations was to the stock and nothing more. The hardest part for me to continue adjusting the RPMs to match my work will always be the fact that I’ll need to turn the lathe off and manually adjust the belt, but if it means I’m getting better results on the finished end, then I’m all about it. Thanks to everyone for their feedback, it’s been fantastic! What is important is the linear velocity at the periphery of the cutting tool in other words the velocity of the cutting edge relative to the wood. If you multiply D by 2, you have to divide RPM by 2 (and vice versa) to keep the product V constant. (we neglect the relatively small speed at which you move your router). Okay…now someone is just showing off LOL! It’s not the speed of the workpiece that you think of, but the speed of the cutting edge through the wood. But I like thinking of the spinning thing, it’s rotating. Otherwise I may also have to think about the angle of entry, the thrust of entry and possibly the horizontal motion of the tool along the rest and that could then add up to even more thinking CHORTLE! I must admit the speeds seem rather high. I tried turning with my Shopsmith with little success. I assumed it was going too fast. I recently stole a Jet mini lathe (14″) for $130. I can turn a bowl with it. Must be me and not the speed of the Shopsmith. Good to know. Thanks for sharing Matt. Running bigger bits at slower speeds makes a lot of sense when you think about it. The reason is that the outermost part of the bit travels faster as the size of the bit gets larger because it needs to rotate 360 degrees in the time as a smaller bit when running at the same RPM. Getting away from woodworking for a moment, I understand that the reason helicopters make that distinctive chopping sound is because the tips of the rotor blades are creating sonic booms as they cross the sound barrier but the centre of the rotor hub is not rotating at anything like that speed. I haven’t been there in years. I think they use to have a bin with my name on it for sharpened saw blades to pick up. Amazingly, this forstner bit is still sharp enough for a few more. But when I make those few more, I’m definitely lowering the RPMs. Something you might want to look at is a variable frequency drive. I don’t know what is involved in setting one up as I have never done the set up but I have used a mill with a vfd and then you can adjust your rpms with a knob.